These amazing one of a kind earrings are handcrafted in Rose Gold and Rhodium-plated Sterling Silver with Pink Spinel, Kunzites, Pink Sapphires and White Diamonds. Gemstones: Kunzites 52,73ct. ; Pink Spinel 13,66ct. Paving: White Diamonds 0,70ct. ; Pink Sapphires 1,13ct. Material: Rose Gold 750; Sterling Silver 925; Black Rhodium For further information please contact us! 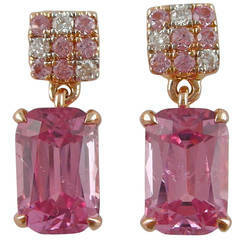 Hot Pink Spinel set in 18 Karat white gold. Elegant earrings for any occasion.